It is the ugliest time of year here in southern Ontario. Melting snow reveals another layer of broken tree limbs after December’s brutal ice storm. Layers of grit coat sidewalks and gardens. The general landscape is grey and, in some cases, even a rusted brown colour where evergreens suffered during the extended periods of intense cold we experienced this winter. As we await spring rains to wash away the grit and warming sunshine to tempt the buds and grasses to grow, I find some consolation in revisiting my photo archives. There I find colourful images of spring in countries we have visited, their vibrant colours reminding me that soon our own backyards will once again burst with colour. I know it’s autumn in the southern hemisphere at present, but I couldn’t resist featuring this beautiful Australian spring delight ~ the Jacaranda tree. 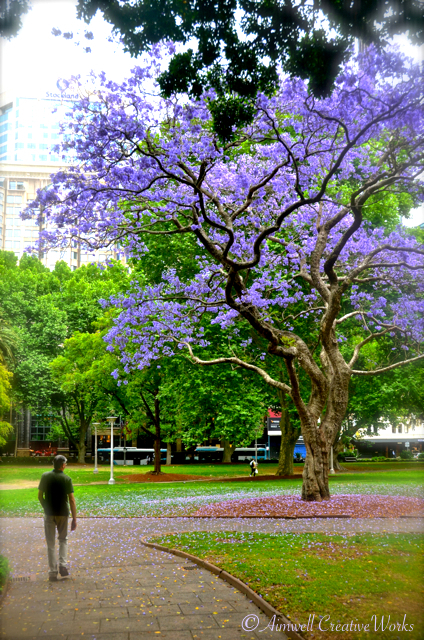 This image taken in Hyde Park, Sydney, Australia. This entry was posted in Australia, Garden, Nature, Photography, Travel, Uncategorized and tagged Aimwell CreativeWorks, Australia, Dorothy Chiotti, gardens, jacaranda, Photography, spring, Travel, winter. Bookmark the permalink. It is UGLY here too. You have my empathy!!! I am crawling the walls.